Mango season is probably the only saving grace in the sweltering summers. 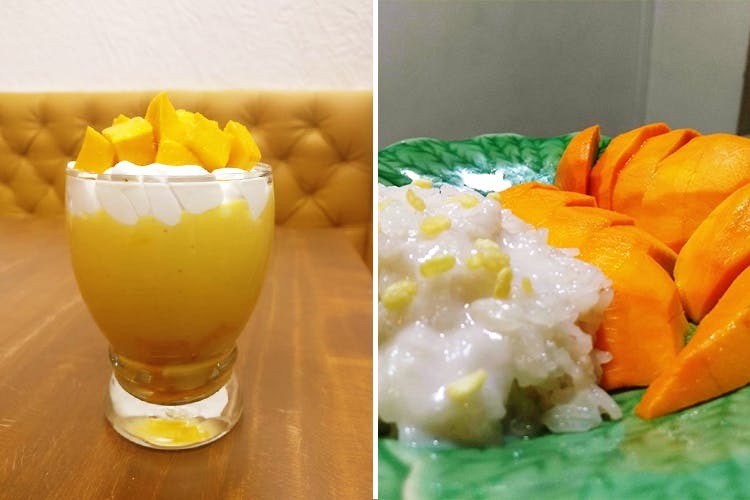 Almost every eatery, cafe, and restaurant in the city makes the most of mango season with special dishes you won’t be able to eat year-round. We’ve rounded up the best and brightest for you, a veritable summer ‘bucket-list’ of 11 mango-based dishes you must try in Pune. Fat Cat’s mango and almond cake is one of their signature favourite pastries you should try during the mango season. It’s usually available on weekends (by the slice), but you can place an order for the entire cake, if you prefer. Also on their menu this season, is a fresh mango chia pudding, which is both, dairy free and keto-friendly, and is also available on the weekends, as part of their all-day breakfast menu. For your daily indulgence, try their fresh mango smoothie made with coconut milk – available every day. The ‘mango devil’ special at The Blue Plate in Aundh is a lusciously layered dessert, served in a tall glass. From the bottom-up, are mango pieces, layered with a rich mango custard, topped with whipped cream, and more chunks of mango pieces. It’s sure to hit your sweet spot. We know you’ve eaten ice-cream, but One O Eight’s mango ‘nice cream’ is a frozen dessert like no other A sugar free, vegan version of ice cream is a hit with everyone who’s tried it. Also on their menu, is a mango-based ‘summer smoothie’ bowl, made with mango, raspberry, coconut milk, toasted nuts, and chia seeds which is ideal for breakfast. They’re also planning on incorporating mango into a fresh salad, so keep your eye on their ‘specials’ blackboard at the cafe. ‘Mango on the Rocks’ is a special dessert at SpiceKlub. A secret recipe of theirs, it involves turning mango pulp into ‘rock’, live at your table, and then serving it with a little mango juice poured over. It’s doubly delicious, and the perfect way to end your meal. Slow-baked to perfection, this mascarpone masterpiece is less dense than your average cheesecake. The smooth, creamy texture pairs well with the nutty biscuit base and fresh mango pieces layered inside and on top of the cake. Available in 7″ and 9″ size, you can place your order for this customised Mango Mascarpone Cheesecake via their website. A cult favourite, you simply can’t get through the summer without trying Sujata Mastani’s Kesar Mango Mastani. A combination of flavoured milk, ice cream, and fresh mango it’s an absolute treat. If you prefer more texture in your dessert, go for the ‘Sujata Special’ Kesar Mango Mastani with the addition of dried fruits. If you’re not a fan of kesar, they have a plain mango version as well. Their prices are pocket-friendly, and there’s always a rush so try and go as early in the day as possible. Pair your parantha thali at Aaoji Khhaoji with a tall glass of their traditional Mango Lassi. It’s refreshing and cooling, especially in this hot weather. An epic combo, you’ll be in a food-coma at the end of this meal, for sure. Shefali Suratwala of Chocoistry has made her mark on the Pune dessert scene, with her famous ‘Mango Rose Cake’. A vanilla sponge cake, layered with whipped cream and fresh mango pieces – the ‘rose’ part comes from the pretty petal-like thinly sliced alphonso mango arrangement, in the form of a rose. Available in half-kg and 1-kg size, this cake is made with all-natural ingredients. Chocoistry operates from Mukund Nagar, next to Swargate. But delivery to Aundh, Baner, Kalyani Nagar, Khadki, Viman Nagar, etc. is available at extra charge. You can also pick the cake up directly from them, or half-way. Place your orders via their Facebook page or by contacting via phone. They also have smaller mango cake-jars of 300ml, available on order. If you are in Pune, you definitely know about Chitale Bandhu. Their delicious range of traditional Maharishtrian snacks such as bhakarwadi, chivda namkin mixes have always kept our taste buds satiated. However, for summers we love their amba barfi which is made of fresh mango and milk and is sweetened to perfection. The Super Mango Affair ‘freakshake’ at Chilled Affair in Wakad is a dessert you won’t soon forget. Made with fresh mango, fresh cream, milk, a ‘secret ingredient’, and topped with whipped cream and mango pieces, it’s only available on-order at the eatery. Don’t miss out on this one. Thai House is as authentic as it gets in Pune, and their mango sticky rice is no exception. It’s delicious, and a must-try if you haven’t already. Go on and indulge in this Thai specialty, while the season lasts.